A Blue Flyer or female Red Kangaroo (Macropus rufus). Unlike the predominantly red males the females have blue-grey fur. Amazingly female red kangaroos are usually permanently pregnant, except on the day they gives birth. 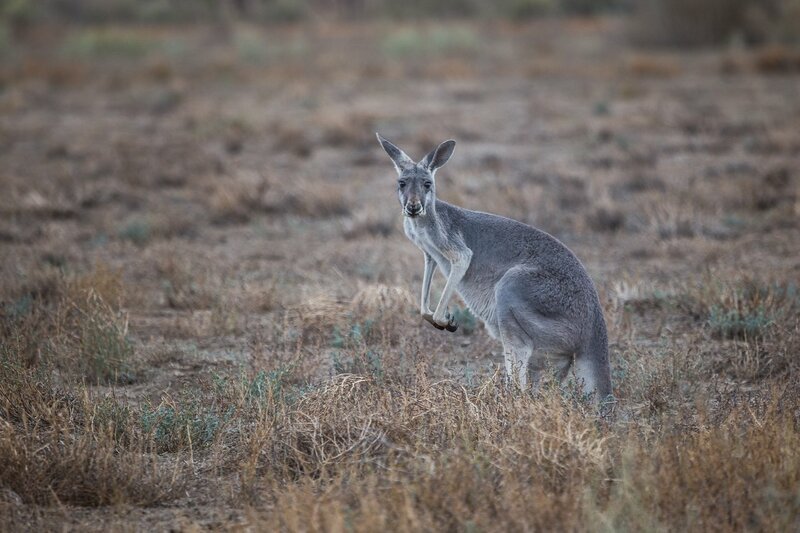 They have the ability to freeze the development of an embryo until the previous joey has permanently left the pouch which occurs after about 235 days. The ability to halt development of a fertilised egg is known as diapause, and evolved in response to the extremely variable climatic cycles of the Australian outback. Paroo-Darling National Park, Outback New South Wales, Australia. Great photo. Have you watched Arrival? Its a decent movie, got some award season buzz a couple of years ago. Funny kangaroo story. I have never seen it; will have to check it out. Your UA account score is currently 4.844 which ranks you at #1291 across all Steem accounts. Your rank has improved 5 places in the last three days (old rank 1296). In our last Algorithmic Curation Round, consisting of 214 contributions, your post is ranked at #108.